Puycelsi is situated to the north west of Gaillac in the Tarn department and is listed as one of France's 'most beautiful villages'. It sits on a large rocky hill overlooking the pretty Tarn countryside. The road winds up quite steeply to the hill-top village of Puycelsi and in the summer you may need to park your car at the edge of the road and walk up the last stretch of road. 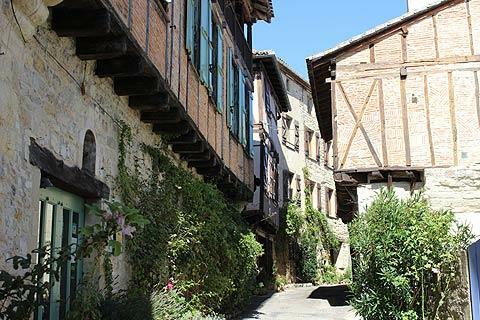 Surrounded by ramparts, Puycelsi is a medieval walled village and once you have passed through one of its fortified gates you enter the narrow streets edged with charming 14 and 15th century stone houses with terracotta tiled roofs and wooden shutters. There are many architectural features to admire such as the half timber buildings, sometimes filled with wattle and daub and sometimes with patterned tiles, stone arches and a number of buildings whose upper storey overhang the lower. 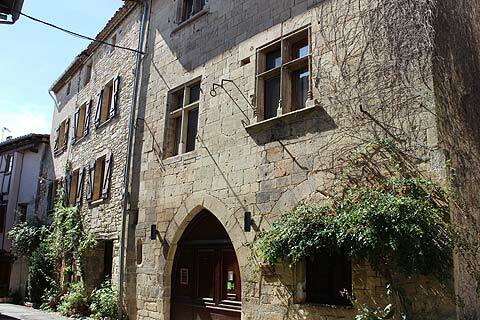 The mairie is a particularly pretty example of one of these medieval houses with an overhanging upper floor. 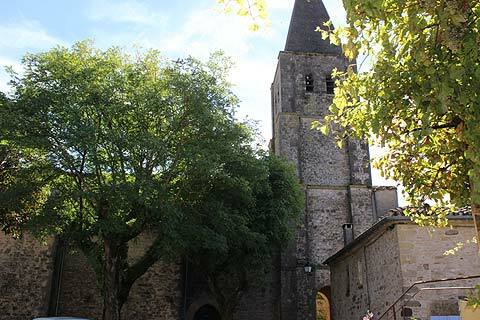 A couple of monuments to note are the chapelle Saint Roch which houses the Puycelsi tourist office, and the Chateau des Gouverneurs which dates back to the 15th century. There is also the 14th century church of Sainte Corneille with an impressive altar and pretty blue painted ceilings. Take a look as well at the ancient auberge which has been an auberge since the 18th century when it housed travellers on the first floor and their horses on the ground floor in an interior courtyard. France This Way commment: somehow Puycelsi remains peaceful even when the number of cars indicates otherwise. Perhaps because there is no central square to the village and so visitors are dispersed through its narrow streets. Walking around the ramparts offers superb views over the surrounding countryside and the Gresigne forest. In total there are 800m of ramparts surrounding the village with some towers and fortified gateways through the thick walls. These have remained intact despite the crusades by Simon de Montfort and the One Hundred Years War. At the foot of the ramparts is a wide flat area called a 'lice' where tournaments of jousting and various other methods of combat took place. Puycelsi is also home to a regional centre for the conservation of ancient fruit and vine varieties. There are over 750 fruit trees and over a hundred grape varieties. It is possible to visit for guided tours (in French), pruning workshops and to buy fruit in season. Puycelsi is in a veritable hot spot of "most beautiful villages with Castelanu-de-Montmiral to the east and Bruniquel to the north. Both villages are delightful. 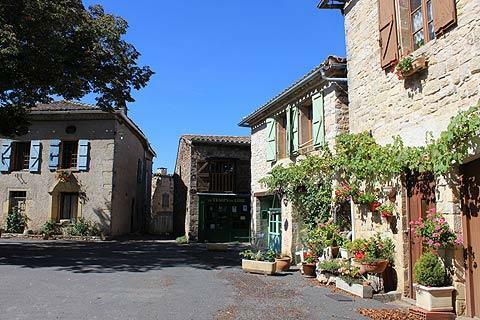 Castelnau-de-Montmiral has a beautiful medieval square surrounded by nice looking restaurants and Bruniquel is a picturesque fortified village with a couple of castles. 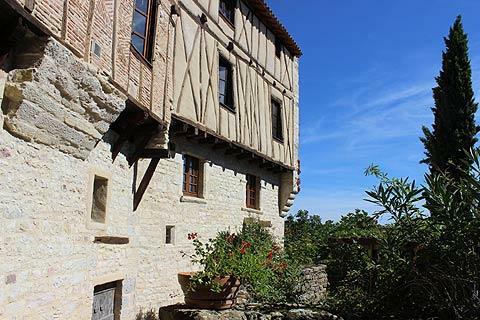 A little further away to the north east is the stunning hilltop village of Cordes-sur-Ciel which is one of the most remarkable medieval villages in France. 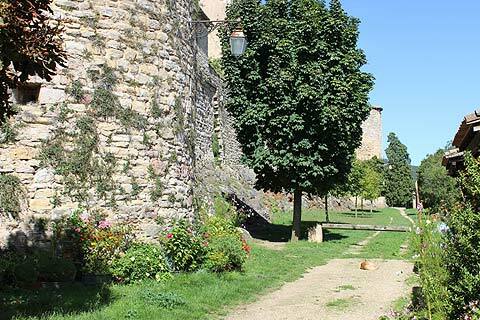 Garden lovers will also enjoy a visit to the Jardin du Paradis at Cordes sur Ciel. Gaillac is also well worth a visit to see its Abbey which occupies a splendid position close to the edge of the river.